It sounds like a classic horror story—eyeless, mouthless worms lurk in the dark, settling onto dead animals and sending out green “roots” to devour their bones. In fact, such worms do exist in the deep sea. They were first discovered in 2002 by researchers at the Monterey Bay Aquarium Research Institute (MBARI), who were using a robot submarine to explore Monterey Canyon. But that wasn’t the end of the story. After “planting” several dead whales on the seafloor, a team of biologists recently announced that as many as 15 different species of boneworms may live in Monterey Bay alone. After years of study, the researchers have begun to piece together the bizarre story of the boneworms, all of which are in the genus Osedax. The worms start out as microscopic larvae, drifting through the darkness of the deep sea. 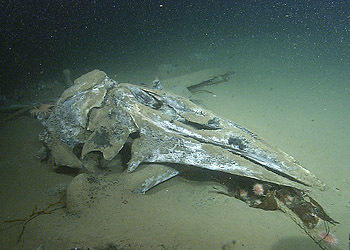 At some point they encounter a large dead animal on the seafloor. It may be a whale, an elephant seal, or even the carcass of a cow that washed out to sea during a storm. Following chemical cues, the tiny larvae settle down onto the bones of the dead animal. Once settled, the boneworms grow quickly, like weeds after a rain. 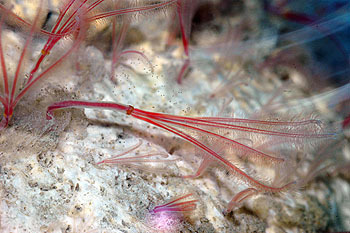 One end of each worm develops feathery palps, which extract oxygen from seawater. The other end of the worm develops root-like appendages that grow down into the bone. Bacteria within these roots are believed to digest proteins and perhaps lipids within the bones, providing nutrition for the worms. Soon the worms become sexually mature. Strangely enough, they all become females. Additional microscopic larvae continue to settle in the area. Some of these larvae land on the palps of the female worms. These develop into male worms. But they never grow large enough to be seen by the naked eye. Somehow these microscopic male worms find their way into the tube that surrounds the female’s body. Dozens of them share this space, not eating at all, but releasing sperm that fertilize the female’s eggs. Eventually the female worm sends thousands of fertilized eggs out into the surrounding water, and the cycle begins again. Dr. Robert Vrijenhoek, an evolutionary biologist at MBARI, has been fascinated with these worms ever since he and his colleagues first discovered their unusual lifestyles and bizarre reproductive habits. Vrijenhoek has been trying to find out how widespread and genetically diverse these worms are. He would also like to know how they manage to find and colonize the bones of dead whales in the vast, pitch-black expanse of the deep seafloor. Between 2004 and 2008, Vrijenhoek’s research team towed five dead whales off of Monterey Bay beaches and sank them at different depths within Monterey Canyon. Every few months, coauthor Shannon Johnson and others on the team would send one of MBARI’s remotely operated vehicles (ROVs) down to study the worms and other animals that had colonized the whale carcasses. To their surprise, the different whale carcasses yielded different types of boneworms. One whale carcass hosted three or four different types of worms. After examining all of the worms, coauthor Greg Rouse concluded that most of them were entirely new to science. The researchers also discovered that the worms would colonize cow-bones placed on the seafloor, which showed that the worms were not limited to feeding on dead whales. In their recent paper in the journal BMC Biology, Vrijenhoek and his coauthors describe the results of extensive DNA analyses on all the different types of Osedax worms that have been discovered so far (including two species found off Sweden and Japan). This work suggests that these worms could belong to as many as 17 different species, most of which have yet to be named. None of the worms appear to interbreed, despite the fact that some of them grow side by side. Based on their appearance and similarities in their DNA, the researchers divided the boneworms into several groups. Some of the worms have feathery palps, which may be red, pink, striped, or even greenish in color. Others have bare palps. One type of boneworm has no palps at all. Its body forms a single, long, tapering tube, which curls at the end like a pig’s tail. This worm has evolved to live in the seafloor sediment near a dead whale. It sends long, fibrous “roots” into the mud, presumably in search of fragments of bone on which to feed. Knowing how fast the DNA of these worms changes (mutates) over time, the researchers can calculate how long it has been since worms in the genus Osedax first evolved as a distinct group. Using one possible estimate of mutation rates, the researchers hypothesized that this group could have evolved about 45 million years ago—about the time the first large open-ocean whales show up in the fossil record. Alternatively, the worms may have evolved more slowly, which would suggest that the genus is much older, and first evolved about 130 million years ago. If this second estimate is correct, the worms could have feasted on the bones of immense sea-going reptiles during the age of the dinosaurs. Eventually the researchers will give all these new worms their own species names. First, however, they must collect enough samples of each possible species for additional laboratory analysis and distribution to type-specimen collections. Like a classic horror story, the macabre saga of the boneworms will continue to thrill marine biologists for years to come. This research was sponsored by the David and Lucile Packard Foundation. A remarkable diversity of bone-eating worms (Osedax; Siboglinidae; Annelida). Robert C Vrijenhoek, Shannon B Johnson and Greg W Rouse BMC Biology. Rouse GW, Wilson NG, Goffredi SK, Johnson SB, Smart T, Widmer C, Young CM, Vrijenhoek RC (2009) Spawning and development in Osedax boneworms (Siboglinidae, Annelida). Marine Biology 156, 395-405. Vrijenhoek, RC, Johnson, S, Rouse, GW, 2008. 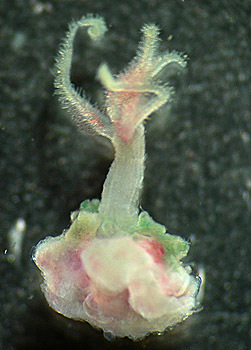 Bone-eating Osedax females and their “harems” of dwarf males are recruited from a common larval pool. Molecular Ecology 17, 4535-4544. Vrijenhoek RC, Collins PC, Van Dover CL (2008) Bone-eating marine worms: habitat specialists or generalists? Proceedings of the Royal Society B: Biological Sciences 275, 1963-1964. 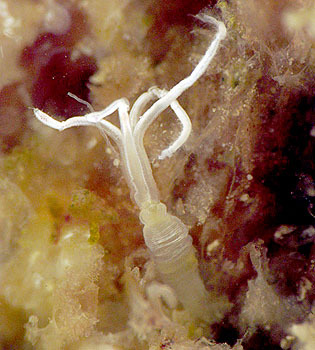 Jones WJ, Johnson SB, Rouse GW, Vrijenhoek RC (2008) Marine worms (genus Osedax) colonize cow bones. Proceedings of the Royal Society B: Biological Sciences 275, 387-391. Rouse GW, Goffredi SK, Vrijenhoek RC (2004) Osedax: Bone-Eating Marine Worms with Dwarf Males. Science 305: 668-671. 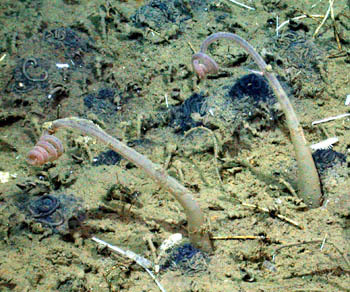 Feb 8, 2016 - The deep sea is full of strange and little-known worms. A new paper coauthored by MBARI molecular biologist Robert Vrijenhoek describes four newly named species of worms in the genus Xenoturbella that have mouths, but no eyes, brains, stomachs, or anuses. 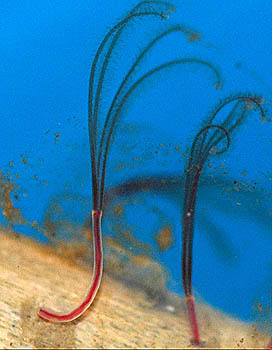 Jul 1, 2015 - An amazing variety of bristle worms thrive in the ocean, both on the seafloor and up in the water column. Here are some examples of the bizarre and wonderful polychaetes that MBARI researchers have seen in the ocean depths.